Check out the marbling of the beef! Gyu-Kaku has over 600 outlets worldwide!! 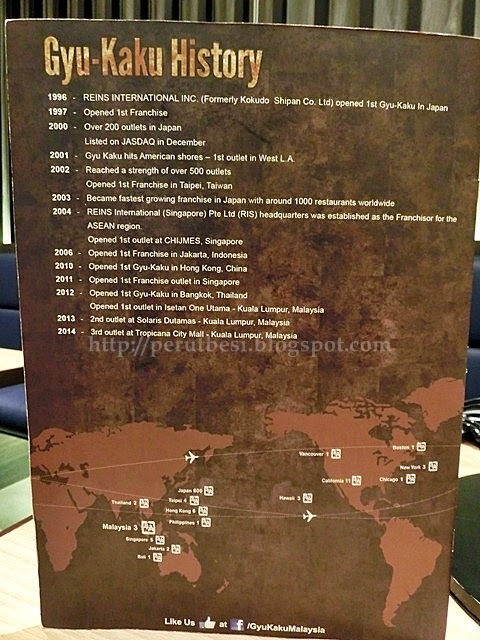 *wow* With 3 outlets in Malaysia i.e. at 1 Utama, Pulika & Tropicana City Mall, this latest player in the food arena is sure to reward Malaysians with their quality food, comfortable ambiance & friendly customer service. At every Gyu-Kaku restaurant, you'll get your simple set of utensils + an apron (square folded item below chopsticks on the left) to ensure that your clothes do not get any stains throughout your meal. Come, let me bring you on a gastronomical journey through the photos that I've taken at the review! *giggles* I was the only blogger there with 3 of Gyu-Kaku's "pros". The load of food that we had was quite frightening...hahaha...SO MUCH FOOD! I think this is a good drink to begin the meal. It's refreshing, tangy & fruity - very fun yet soothing after a long day at work. Crispy on the outside, moist & tender on the inside - that's what Gyu-Kaku's Chicken Karage is like. They serve much larger pieces compared to those available at other restaurants, but it's still nice to eat although not as 'fun' & 'bite size'. If you're looking for a sumptuous soup at Gyu-Kaku just like at a Korean bbq restaurant, enjoy the Korean-style of tofu jige at a Japanese restaurant! :P Are you confused? It's called variety! I love the spiciness & 'sourness' from the kimchi. Sizzling hot udon noodles with vegetables & chicken. Pretty tasty, but I still prefer hot stone rice to noodles. I was beginning to feel full after enjoying all the appetizers, rice & noodles, but I had to ensure that I still have stomach space for the meats! That's like the MUST-HAVEs here at Gyu-Kaku. Unlike Korean bbq restaurants where they have the air/smoke suction pipes on top of the grill, Gyu-Kaku's suction pipes are built in at the bottom of the grills! Very, very minimal bbq smoke smell will fill the air, so don't worry about walking out smelling like a piece of bbq meat. My Wagyu Briskets & Wagyu Karubi..SO GOOD! As the pieces of meat are bite-size, all you need is 10-30 seconds to cook it! VERY efficient, fast to cook, GREAT to eat! Suitable for those who are very hungry & love their meat cooked perfectly (medium rare, medium well...etc). Gyu-Kaku serves 2 dips for the meats as well, one that's slightly spicy + sweet, while the other leans towards savory. For those who don't take beef, don't worry, their chicken fillets are lovely as well. You can have it pre-marinated with tare, shio, miso, spicy miso, teriyaki, garlic or basil. Gyu-Kaku is opened for both lunch & dinner, but the crowd for both meals consist of very different people. Those who are working or students will love their lunch idea of a quick, simple & pocket-friendly Japanese meal. Gyu-Kaku has 2 cooked chicken sets, 2 barbecue sets, 2 hot stone rice sets & 2 noodles sets, a very substantial variety for lunch! Gyu-Kaku has 8 different lunch sets for those on the go. 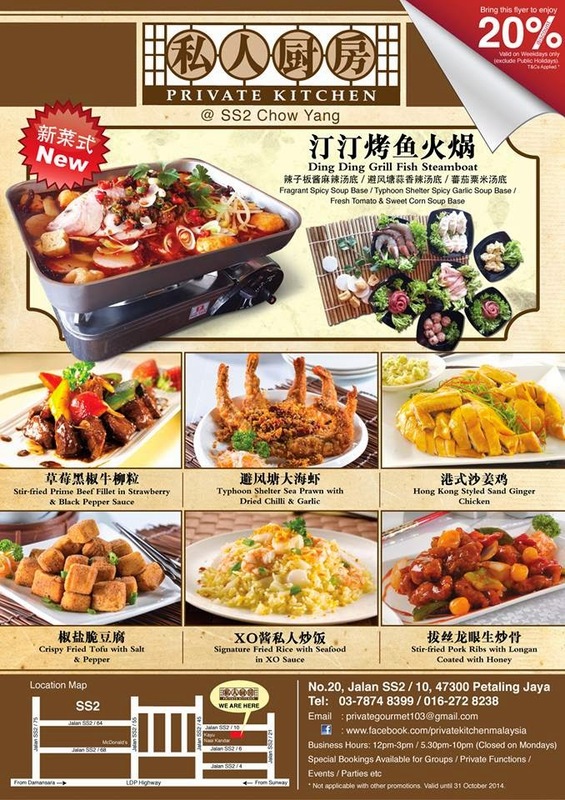 Prices range from RM13.90/set - RM19.90/set, from rice to noodles & even bbq meats! Worth your penny as the portion is decent & the milk pudding is something not to be missed! Fuh! Now that we're all stuffed, we moved on to the final course of dinner, desserts! Gyu-Kaku offers a handful of good desserts. Two of their most popular desserts are the S'mores & Milk Pudding, items that you will rarely find elsewhere. This was SO GOOD! Silky smooth, soft yet firm, not overly sweet yet sufficient to be a dessert & just SO comforting after a meaty meal! I WANT MOREEEEE...! Step 3: Sandwich & remove stick! What are you waiting for? Make your own S'mores! Your eyes did not deceive you! You read it right :D As long as the adult orders an ala carte dish/meal from the menu, the child will get to order a kids' meal from the menu for free! It was a pleasant dining experience here at Gyu-Kaku. I'll surely be back for more barbecue meats! It's a different experience from Korean bbq, so don't expect loads of complimentary & refillable side dishes while dining at Gyu-Kaku, but you can certainly look forward to great cuts of bite-size meat!